Wheeling Elementary District 21 Superintendent Michael Connolly knows payroll for his district is higher than average, but he doesn’t expect that to change any time soon. The district’s pay level helps retain employees in a state experiencing a growing teacher shortage, Connolly believes. A recent report issued by Advance Illinois, a public education policy and research group, showed more than 1,000 teaching vacancies throughout the state. Only one of those unfilled positions was in District 21. 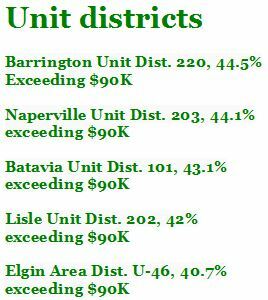 Nearly 60 percent of District 21’s 530 educators were paid more than $90,000 last year, according to the district’s 2018 Annual Statement of Affairs report submitted to the Illinois State Board of Education. A Daily Herald analysis of 95 suburban school districts showed more than 35 percent of educators in those districts received “gross compensation” of $90,000 or more last year. Those figures include salaries for full-time certified teachers and administrators as well as any coaching or teaching stipends that count as pensionable earnings with the Teachers’ Retirement System. ISBE requires districts to identify how many educators fall within certain compensation ranges. The $90,000-plus category is the highest tracked in the reports.